Incentive zoning is a "broad regulatory framework for encouraging and stimulating development that provides a desired benefit or development type as established in adopted planning goals." 1 An incentive zoning system is usually implemented on top of an existing base of development regulations and works by offering developers regulatory allowances (often increases in density/intensity) in exchange for agreed-upon benefits including transit-supportive development. credit: Baldwin Park Downtown TOD Specific Plan. To encourage private developers to design and build transit-supportive projects, jurisdictions can provide incentives and/or bonuses to projects that a) are located in transit zones, and/or b) provide benefits to the community, such as affordable housing or open space. In particular, affordable housing is highly desired around transit, since studies have shown that low-income populations benefit the most from transit access and use it at greater rates than the general population. However, the State of California already has a law that provides an adjustable density bonus in exchange for including affordable housing units in new construction, so many communities have elected not to include additional local bonuses on top of this existing provision. Affordable housing is highly desired around transit, since studies have shown that low-income populations benefit the most from transit access and use it at greater rates than the general population. 2 State of California law provides an adjustable density bonus in exchange for including affordable housing units in new construction, and local agencies may build upon and augment these incentives if they so choose. Typically, a new development would receive 10% to 33% bonus in dwelling units per acre, or 0.25 to 1.0 additional FAR for non-residential development (based on existing bonus provisions in several Los Angeles cities). Other incentives might include bonus height, reduction in the parking requirements, flexibility in development regulations , fee waivers or reductions , and permitting priority . Density bonuses can be used to encourage and increase the financial viability of: 1) mixed use development (residential over commercial); 2) building on vacant or underutilized parcels or non-conforming uses; 3) projects that provide a high percentage of deed-restricted affordable housing units; and 4) projects that include public benefits such as public open spaces, plazas, new pedestrian ways, or improved connections to transit stations. 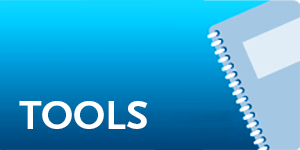 This tool can be applied as a General Plan policy, a zoning code or a stand-alone ordinance. The incentives can either be discretionary (subject to a director or commission review) or by-right(available if the requirements are met). Parcel assembly, promoting the consolidation of multiple smaller parcels with less development potential into one developable parcel, can also be incentivized through development fees, reduced inclusionary housing requirements, parking reductions, and density bonuses. Larger parcels enable denser development (a smaller percent of the total lot area is lost to setbacks, deeper lots enable underground or podium parking arrangements, and economics of scale allow for more robust financing of larger projects). More intense development also provides greater opportunity to incorporate affordable housing, which is strongly correlated to transit ridership. Increased feasibility for development along transit-served corridors and near transit stations. Increased supply of affordable housing. 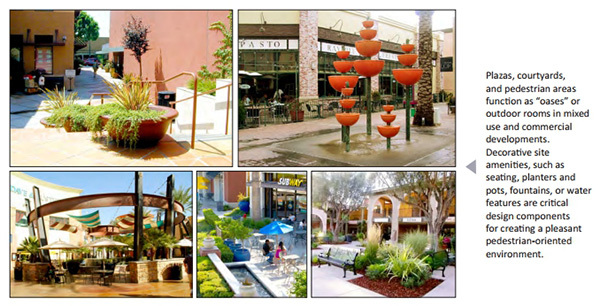 Provision of community benefits such as public open space, senior housing, streetscape amenities and improvements. 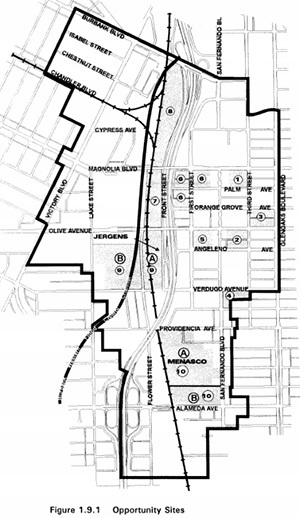 Los Angeles County Green and Blue Line TOD Ordinance. This County ordinance establishes a number of geographic areas as transit-oriented districts where the special incentives will apply (approximately one-quarter to one-half mile radius around the station). 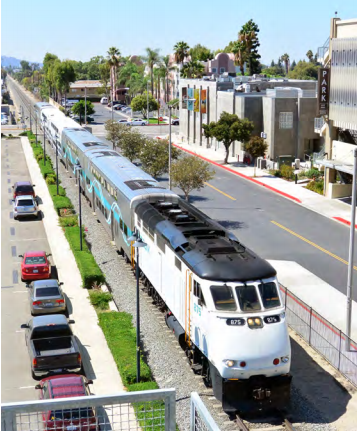 To achieve the goals of increased transit ridership, reduced traffic congestion, and improved air quality, “unique development standards and case processing procedures” will be in effect in these transit-oriented districts. Infill Development – where development is proposed for vacant lots or non-conforming uses, a density bonus of 25% shall be granted subject to a director’s review. Lot Consolidation – for collected parcels totaling over 15,000 square feet, a range of density bonuses (10 to 15% bonus) shall be granted subject to the provision of recreation/open space facilities and extra landscaping. Affordable Housing – a density bonus of up to 50% shall be allowed if at least one-third of the units are provided for low-income households or half of the units are reserved for qualifying senior citizens (for a minimum of 30 years). The Green Line Ordinance also offers parking reductions (pg 29); within a transit-oriented district, reductions of up 40% are offered for multi-family residential projects. Reductions of up to 60% can be granted for certain neighborhood retail and community-oriented uses. See more , Pages 4 to 62. Baldwin Park Downtown TOD Specific Plan. The open space area (courtyard or plaza) shall be a minimum of 1,000 square feet with a minimum dimension of 25 feet, and no more than 3 feet above the level of the street it adjoins. Required setback and parking areas shall not count toward the open space calculation. Required private and common open space for residential units may not be counted toward the open space calculation. The open space area shall have direct access to a public street, which is open and unobstructed from the ground level to the sky. The courtyard or plaza shall be landscaped and includes amenities such as seating and planters. Bonus units are also available for the provision of public art (if it exceeds a certain valuation and meets accessibility/visibility standards). See more , Page 45. Culver City Community Benefits Incentive Program. Culver City’s incentive program is city-wide, focused on mixed-use zoning, and based on an innovative calculation related to the economic valuation of new unit market values. For mixed-use projects, it provides for an increase from 35 units per acre to 50 du/a (a 40% increase). The public benefits that trigger the bonus allowance are streetscaping improvements, public parking (in excess of that required by code), pocket parks and open space (minimum 5,000 sf), green construction, and other benefits as approved by Council. 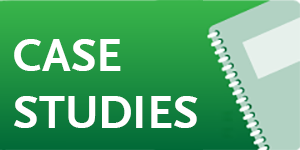 These community benefits must be incorporated on-site for the life of the project, unless they are part of an off-site public improvement, whereupon the developer provides an in-lieu fee contribution. The manner in which the required quantity of developer contribution towards public benefits is calculated is unusual – it is based upon the additional profit derived from the additional dwelling units allowed by the density increase. Specifically, the City uses the number of additional units multiplied by 15% of the market value of each unit. The value of the additional units is estimated and agreed upon the city and developer, and 50% of the value enhancement is dedicated towards community benefits. Creating a clear link between developer profit and improvements in the community is a concrete way to illustrate that giving special bonuses to a project will result in direct improvements in local quality of life. Community Design Element, City of South Gate. Neighborhood Medium-High: A density bonus of up to 5 additional dwelling units per acre. Neighborhood High: A density bonus of up to 10 additional dwelling units per acre. Boulevard Medium-High. A density bonus of up to 5 additional dwelling units per acre and 0.25 FAR for nonresidential uses. Boulevard High: A density bonus of up to 10 additional dwelling units per acre and 0.5 FAR for non-residential uses. Urban Village: A density bonus of up to 20 additional dwelling units per acre and 0.5 FAR. Office/R&D: A density bonus of up to 1.0 FAR. Civic/Institutional: A density bonus of up to 1.0 FAR. “Green” buildings certified by the US Green Building Council or another independent and nationally recognized organization. 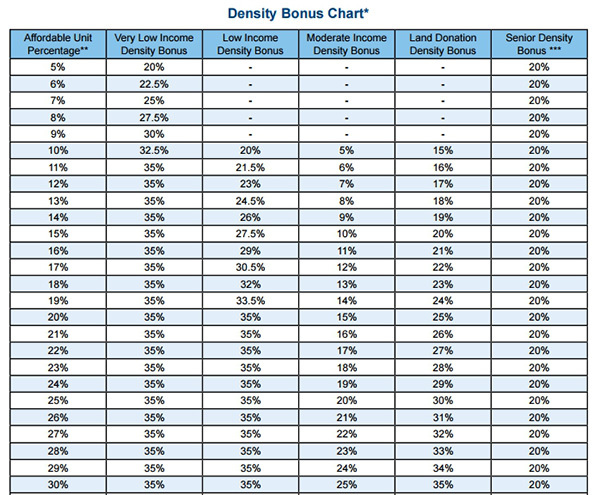 P.3: The density bonus for amenities will be in addition to the density bonus for affordable housing. Properties within one-quarter mile of a regional intermodal transit center and more than 500 feet from a R-1 or R-2 zoned property may exceed the 12-story (164 foot) height limit up to a height of 15 stories or 205 feet through the City’s planned development process if the goals of the Plan, such as exceptional pedestrian linkages to passenger rail stations are met. Increased density, reduced on-site parking, and other appropriate incentives are provided for developments that maximize job creation if direct physical access were provided to the RITC (regional intermodal transit center). Increased density, reduced on-site parking, and other appropriate incentives are allowed for developments which are designed to maximize revenue generation and facilitate vehicle trip reduction programs. See more , Pages 26 to 35. The Density Bonus Law (found in California Government Code Sections 65915 – 65918) provides cities and developers with powerful tools to encourage the development of affordable and senior housing, including up to a 35% increase in project densities, depending on the amount of affordable housing provided (there is a sliding scale that varies by the affordability level of the units). The Density Bonus Law is about more than the density bonus itself, however; it is actually a larger package of incentives intended to help make the development of affordable and senior housing economically feasible. Other tools include reduced parking requirements, other incentives and concessions such as reduced setback and minimum square footage requirements, and the ability to donate land for the development of affordable housing to earn a density bonus. Often these other tools are even more helpful to project economics than the density bonus itself, particularly the special parking benefits. The most important thing to note about the law is that the Density Bonus is a state mandate, and this a developer who meets the requirements of the state law is entitled to receive the density, regardless of the wishes of the local jurisdiction. This conflict has caused tension in certain communities, but the law has undoubtedly resulted in the construction of more affordable units overall. Specific bonuses are shown below in the table, and cities must be aware of this legislation when planning for transit-supportive places and communities.